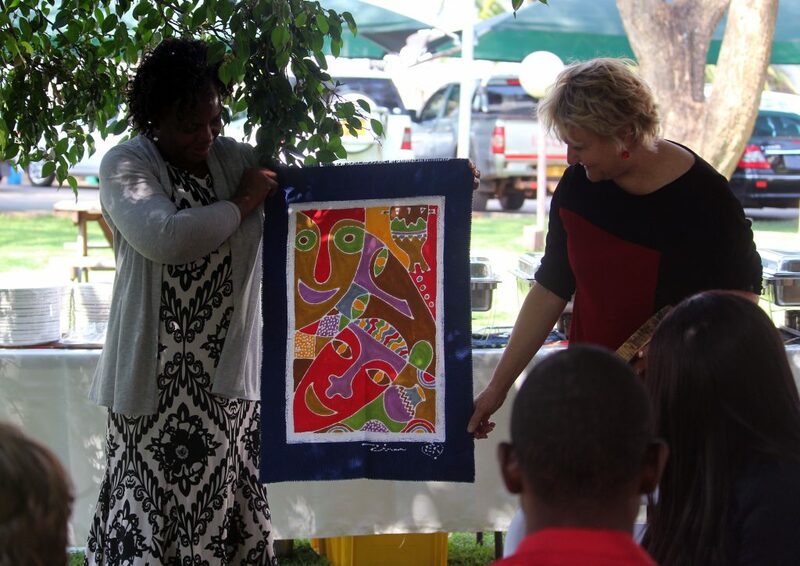 Dr. Batsi Makunike (L), I-TECH ZImbabwe Country Director, presents Dr. Ann Downer, I-TECH Executive Director and former PI of the Zimbabwe Care and Treatment project, with a farewell gift. The batik was made by using sadza porridge to apply the dye to the fabric. Last Saturday, 1 December 2018, marked the 30th World AIDS Day, with a focus on urging all people to know their HIV status, as well as on ensuring access to prevention, care, and treatment services for those affected by the disease. Two programs at the International Training and Education Center for Health (I-TECH) are working in concert with local partners to help make those goals a reality in Zimbabwe. A center in the University of Washington (UW) Department of Global Health, I-TECH has worked in Zimbabwe since 2003, starting with a $150,000 grant for an assessment of the need for HIV training in the country. Since then, work in the country has expanded to two awards totaling more than $24 million for the current year—one of which focuses on HIV testing, care, and treatment and the other on voluntary medical male circumcision (VMMC) for HIV prevention. Both projects are funded by the U.S. Centers for Disease Control and Prevention, through the President’s Emergency Plan for AIDS Relief (PEPFAR), and operate through consortia comprising I-TECH and local partners. The consortium for the VMMC award, ZAZIC, will continue to be led by Dr. Scott Barnhart, Professor in the UW Department of Global Health and School of Medicine. However, the consortium for the care and treatment award, the Zimbabwe Partnership to Accelerate AIDS Control (ZimPAAC), has undergone a change in leadership: its new Principal Investigator (PI) is Dr. Stefan Wiktor, Professor in the UW Department of Global Health. Dr. Wiktor was handed the baton by the project’s previous Principal Investigator, Dr. Ann Downer, I-TECH Executive Director and also a Professor in the department, during a ceremony in Harare in October 2018. Through ZimPAAC, I-TECH provides direct service delivery and site support for care and treatment at 372 public sector health facilities to strengthen health systems and improve the quality of care and treatment services and increase enrollment, initiation and adherence. The VMMC project has already performed 313,267 VMMCs, as of October 2018, surpassing PEPFAR targets. The new award aims to circumcise 500,000 men over five years, resulting in the prevention of approximately 100,000 new cases of HIV. “It has been such a privilege to work in Zimbabwe, a country that has a real chance to control the AIDS epidemic—both because of generous funding from PEPFAR and, more importantly, because of the caliber of the Zimbabwean people who live and work here,” said Dr. Downer at the handover ceremony.